The price of coffee is falling. Earlier this month, Starbucks lowered prices on its coffee sold in grocery stores to help match other price drops by J.M.Smucker Dunkin' Donuts and Folgers. In all, Smucker lowered prices an average of 6%, while Starbucks is lowering prices on its own brand by 10% and its Seattle Best brand by 12.5%. 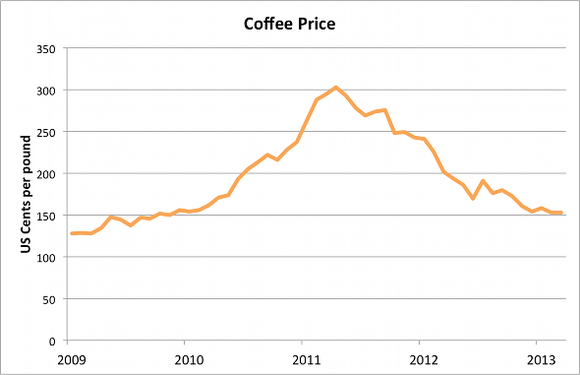 This is because the cost of coffee beans, after hitting a peak in April 2011, has since fallen by half. But even though the beans themselves cost less, it doesn't mean Starbucks will lower prices on your Hazelnut Macchiato. In 2011, poor growing conditions led to a run-up in the price of coffee. As a result, coffee prices across brands were repeatedly raised. In Aug. 2010, Smucker raised prices an average of 10%, followed by another hike of 10% a few months later, and then another hike of 11% a few months after that. Now, however, production of coffee is more than demand, and prices are falling. And with further falling prices forecast, to an estimated $1.25 per pound from the current $1.50, coffee companies are reluctant to make large purchases that would support the price. The same goes for Starbucks, which, according to CFO Troy Alstead in the latest earnings call has "a little bit more than half of [its coffee] needs locked up" for its 2014 fiscal year. Additionally, the falling coffee cost is expected to boost Starbucks' earnings by $100 million in the next fiscal year. And for its 2015, Alstead adds that the company is not "meaningfully priced at all" into its coffee costs. With prices still falling, but no meaningful prices locked in for Starbucks' future, lowering prices of any of its beverages would be precarious if it had to reverse course for an unexpected rise in coffee costs. Raising prices is a difficult maneuver, even if it would simply make up for a previous cut in prices. And there is little direct comparison for the consumer when at a Starbucks vs. at the grocery aisle, lessening the need to lower prices in line with any competitors. And even if Starbucks had confirmed its coffee contracts for the future, it doesn't seem it needs to help drive sales in such a way. Starbucks has not disappointed in sales growth and doesn't need to give up any profit based on its 6% increase in same-store sales the past two quarters and 7% increase in its last fiscal year. So while you can enjoy lower coffee prices in the grocery store, the barista-served variety will likely cost the same. If you are looking for some dividend-paying stocks to help cover your everyday latte, check out The Motley Fool's special free report outlining our nine top dependable high-yielding stocks. It's called "Secure Your Future With 9 Rock-Solid Dividend Stocks." You can access your copy today at no cost! Just click here. The article Don't Expect a Cheaper Latte Despite Falling Coffee Prices originally appeared on Fool.com. Fool contributor Dan Newman owns shares of Starbucks. The Motley Fool recommends and owns shares of Starbucks. Try any of our Foolish newsletter services free for 30 days. We Fools may not all hold the same opinions, but we all believe that considering a diverse range of insights makes us better investors. The Motley Fool has a disclosure policy.